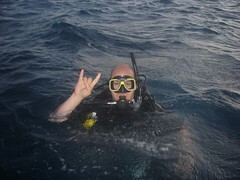 I just got back from my three day diving trip to the Great Barrier Reef! It was the most incredible thing ever, but I am far too tired to talk about it right now. Highlights included getting certified (obviously! ), diving with sharks, diving at night (creeeeeeeeeeepy) and life at sea. The company I went with was Pro Dive, and I can’t recommend them highly enough. They, and the trip was everything I could have hoped for. I have a goodbye party with everyone tonight at 7:30pm (one hour from now), then I am going to get a really good night’s sleep and then I’ll have more to say. Till then you can check out the first few batches of photos from the trip. There is more to come! A couple more weeks and I will be in the Philippines!! Hope you can visit me!! I have been planning everything we could do in a notebook!! HAA These 2 comments I am giving you, I am AT SCHOOL!!! Haa this isnt blocked so I can talk to you on here and you can reply on AIM if you are on when I send you an IM. Haa. I can say stuff to you at shcool!! Oh, and this website is sooo IMPRESSIVE!! I can send you stuff of what I wrote about my trip to the Phillippines. I am writing everything down in a notebook!! I hope one day you can read it before I move there.